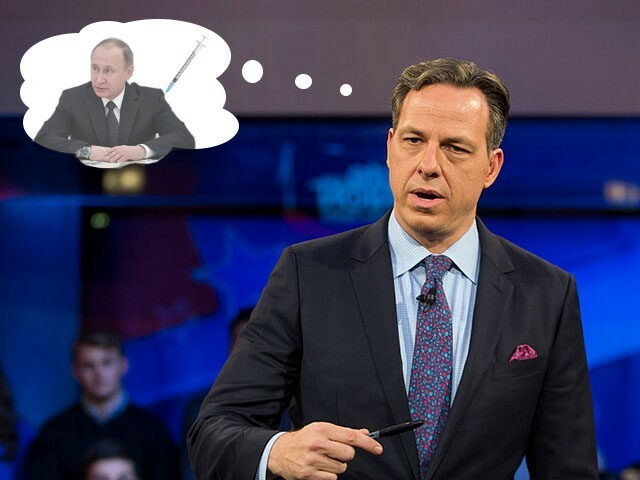 In a roundtable with four other “top TV broadcasters” — ABC’s George Stephanopoulos, NBC’s Savannah Guthrie, CBS’s Gayle King, and Fox News’s Bret Baier — Tapper jokingly hoped that he could uncover real Truth from Putin with the help of barbiturates. Final question: Who would you most like to interview? TAPPER Are these interviews-interviews or are they sodium pentothal [a trademarked name for the compound] interviews? (Laughter.) I mean, as long as we’re doing a dream [interview], a Putin interview with sodium pentothal would be fantastic. Not quite. They indeed testified there was no hacking of voting machines; no votes changed. cold in Moscow tonight, Comrade? If all these Russian trolls got off Twitter and got to work maybe they'd finally have an economy bigger than Italy's. The Hollywood Reporter roundtable provided little else of interest, aside from Tapper and his peers’ newfound outrage, at the start of a Republican administration, that political flacks try to push spin. Tapper proudly recounts how he tried to make then-Vice President-Elect Mike Pence answer for Mike Flynn Jr’s tweets — then says that he would cover “more policy” if given a chance to do 2016 any differently.